Preceding this important statement made by the President, the Government of South Africa launched a health and education campaign at Walter Sisulu Square in Kliptown on 11 August 2008. This campaign arose from the recognition that health and education should be at the centre of the Social Transformation Programme for the next five years. It is against this background that the Kungwini Parliamentary Constituency Office (PCO) raised its hand to be counted among those that have heeded the call by the State President. To this effect, Kungwini PCO, through the effort of a successful local entrepreneur, Mrs Ameenia Nanabhai, better known as uMakoti, made it possible that a reunion between the South African born Dr Mohamed Rashid Goolam Hussain and the local leadership takes place. Dr Hussain, a medical doctor by profession, studied at the University of Natal and later practised as a general practitioner in the former KwaNdebele, Kwaggafontein. In the late 1980s, due to the unjust laws and the documented history of segregation during apartheid South Africa, Dr Hussain left the country to pursue his career in Canada. He is currently a Medical Director at the Tri-Hospital Sleep Laboratory West in Canada. He is decorated with a number of achievements in his involvement in both the private and government circle in Canada. 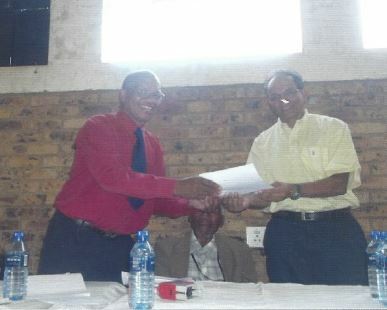 The Kungwini PCO has partnered with Dr Hussain in advancing the concept of quality education for all. In 2012 and 2013 he formed part of the delegation that consisted of Members of Parliament, Members of Provincial Legislation, councillors, the Chief Whip, the Speaker of Council, religious groups, school governing bodies, city officials, Members of the Quality Learning and Teaching Campaign and other important partners during the Back to School Campaign led by Members of the Executive Council in Gauteng Province. The Members of Executive Council, M Nkomfe and N Kholisile, were among those who graced this outreach programme. During this period, schools such as Dan Kutumela High School, Ekangala Comprehensive School, Sithjejiwe High School, Strauss High School, new Zithobeni Combined School and others, were visited by the leadership of government joined by other progressive formations within Region 7 of the City of Tshwane. Doctor Hussain has led a number of groundbreaking initiatives which included addressing Grade 11 and 12 learners on the importance of studying Maths and Science; he also introduced the School Health Initiative Programme which focused on conducting medical investigations for learners attending the School for the Disabled in Sizanani. He has conducted a cohort study which seeks to address the reduction of barriers to health care, learning and development, as well as the promotion of essential health awareness and behaviour which will have direct impact on a child ‘s school performance, absenteeism and overall health matters. He introduced the concept of teacher-performance at th is school and assisted in improving its results. The role of the Kungwini PCO has been instrumental and commendable to Dr Hussain’s work, noting many of the socio-economic challenges that exist and affects the learners, with limited resources to overcome these unfortunate circumstances. With his involvement as a doctor in this project, he has been able to offer his [medical] skills and knowledge. His contribution has enabled the district and all its social partners to benefit towards realising the goal of achieving quality health and education in underprivileged communities, residing in areas such as the erstwhile Metsweding. It is very commendable to experience such a good partnership by local citizenry, in particular with someone who is a professional. Dr Hussain dedicates his life towards addressing the core issues that a touches the lives of ordinary people, without any financial gain. During his last days in South Africa before departing to Canada, the Kungwini PCO, together with the Office of the Chief Whip, deemed it fit to pay a farewell tribute to Dr Hussain as part of recognising his selfless contribution – he visits South Africa during his off-season and holidays, usually between December and March each year. The Kungwini PCO organised a farewell which was attended by the key local stakeholders, such as Leaders of the Gauteng North District, religious groups led by Pastor Jele, Hon MP JB Sibanyoni, Hon MPL R Ndzuta, local councillors led by a convener, Cllr J Masombuka, school governing bodies and various school principals as well as the leadership of the ruling party in the Metsweding zone. All the speakers commended both the Kungwini PCO and Dr Hussain for the work done towards putting Gauteng North District and the Metsweding constituency on the map. This included celebrating the top achievements of the matric results and being the best performing district in the entire Gauteng for 2012. During this event which took place on Constituency Day, Monday the 25th of March 2013, the Chief Whip of Council, Jabu Mabona, also praised Dr Hussain for partnering with the local stakeholders to achieve a better life for all. He emphasised that this will only be realised when all people are glued together and more hands on and practical in contributing to the slogan of “working together we can do more”.